This article deals with the internal feedback stabilization of a phase field system of Cahn–Hilliard type involving a logarithmic potential F, and extends the recent results provided in Barbu et al. (J Differ Equ 262:2286–2334, 2017) for the double-well potential. The stabilization is searched around a stationary solution, by a feedback controller with support in a subset ω of the domain. The controller stabilizing the linearized system is constructed as a finite combination of the unstable modes of the operator acting in the linear system and it is further provided in a feedback form by solving a certain minimization problem. Finally, it is proved that this feedback form stabilizes the nonlinear system too, if the stationary solution has not large variations. All these results are provided in the three-dimensional case for a regularization of the singular potential F, and allow the same conclusion for the singular logarithmic potential in the one-dimensional case. 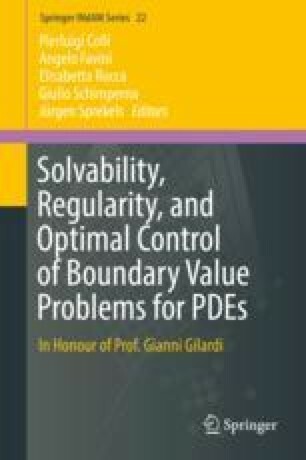 This paper is dedicated to Professor Gianni Gilardi on the occasion of his 70th anniversary. The author would like to thank Professor Pierluigi Colli and the anonymous reviewer for the observations made on the earlier version of the paper.